Holidays with children are the most beautiful thing. Pictures of cheering children provoke a smile long after returning from the sea. This is true only under the condition if your children are completely healthy. Parents have to prepare well and answer all current challenges. Just like that you will avoid any danger to the health and safety of your kids. Fever, allergies, nausea and burns are the most common children's ailments when travelling and holidays. Luckily with adequate assistance it cannot last long. Learn what to do to make your holidays with children great. Babies up to a year, especially those up to six months, are not suitable for long journeys. Therefore, they should not be taken on the road that lasts longer than two hours. The flight is not for babies younger than six months - due to pressure in the ears. Holidays with baby therefore are not recommended, especially not before 1 birthday. Travelling at night with small children is not recommended, because any unforeseen circumstances in the dark with kids can be a problem. It is better to go on holidays with children in the early morning when you are well rested. While driving you need to make frequent breaks, at every hour or two. The children required water and light, dry foods. If the child does not tolerate trip, half an hour before departure you should give him or her antiemetic. This drug will reduce peristalsis and prevent possible nausea and vomiting. This drug will also put your child to sleep, and help him or her to easily travel. If you are planning a vacation with children in Montenegro, Greece, Turkey and if the air condition it should not be too turned very high or to blow in the direction of the child. 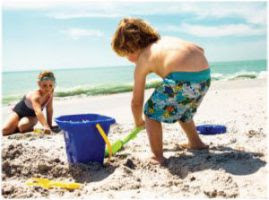 Are you planning a vacation with children who are still small, then do not expose them to the strong sunlight. Dermatologists recommend that babies by no means sunbathe. Children under one year should not be directly exposed to the sun. A baby's skin has not developed all the defensive layers. It can be carried out in the early morning and in the evening after 19 hours. Pre-schoolers and schoolchildren should smear preparations with high sun protection factor labelled 50+. Top with those containing mineral factors, but leave whitish mark on the skin and physical barrier. No kids at this age in the period from 10 to 17 hours should be directly exposed to the sun. You should know how that thin shirts are not enough protection from UV radiation. Even through them you can get sunburn while playing in the shallows. In the event that, despite all the precautions it happens to a child, it needs to take shelter in the shade. Every six hours putting wet compresses to the skin and hold it for about 15 minutes. Also it abundantly lubricated with moisturizer. They contain a lot of moisture and plant extracts that have a calming effect on the burned skin. However, if a kid gets a fever, and his skin is blistering, it is best to take it to a doctor. Holidays with children sometimes are accompanied by frequent stools and abdominal infections. The safest is to buy bottled water and take into account the durability of foods. Avoid consumption of mayonnaise, minced meat, and ice cream on tap. Otherwise, food poisoning has been very turbulent and sudden, heavy multiple vomiting. After that you stool becomes watery. Usually no fever, but the child is dehydrated, fatigued, exhausted. The safest to do is to take it to the doctor because sometimes it is necessary to include intravenous dehydration. Almost no holidays with children cannot pass without tears from falling down or cuts. What to do when that happens? Laceration first wash with cold running water - hot is not good because it can prolong bleeding. Then disinfectant is applied, in the form of a spray. The first day the wound should be covered with a sterile dressing or plaster. The same with cuts except if it is longer and deeper than two centimetres, then report to a doctor. If within an hour or two the wound still bleeds go to the emergency room, in order to be sewn. Otherwise it will be open again and hurt more. Children have not developed a centre for thermoregulation and therefore cannot, as adults, to cope with extreme temperatures. Therefore it is easier for them to get convulsions. What are the symptoms of sunstroke? Identified by the fact that the child was flushed, dehydrated, his mouth was dry, and the temperature increased. So if you are planning a vacation with children at sea, take care of all of the above. You may notice dizziness, fever, and even loss of consciousness. It needs to get out of the sun, in a room where the temperature is around 23-25 degrees, and give him or her plenty of fluids. If the symptoms are more difficult, it is necessary to seek medical help. Parents need to be alert and ready for any possible inconvenience. Here is what you should include in travel with children. In case of overheating, sunstroke or heatstroke, then viral and bacterial infections, fever appears. Then the child should be watered with liquid, preferably water. See that your child drinks at least 6-8 glasses a day. Give him some of the drugs that simultaneously reduce temperature and relieve pain. Recommendation: acetaminophen or ibuprofen. Sun allergies often occur if you do not use sunscreen against solar radiation. Often there are allergies after insect’s bites or pollen. Therefore consider packing some medication from the group of antihistamines. Today, syrups that can be drunk and gels and creams that are applied on the skin are produced. They will reduce itching, redness and discomfort due to allergies. For a selection of products it is best to consult with your child's paediatrician. The vomiting is usually accompanied by diarrhoea, so you need to have probiotics. And not just that, but probiotics that target diarrhoea. If not they do not help, youngster may be given some of the intestinal antiseptic, to stop watery stool. For the compensation of electrolytes solutions are used to rehydrate, typically in the form of granules to be dissolved in water. They have a double positive effect. On one hand, make up for fluid and electrolytes lost by vomiting, and on the other prevent it from happening again. For more serious cases cough syrup is natural and quite sufficient. For holidays with children it is useful to take the nasal spray. However, if you go to the sea, then it is not required. Inhalation of sea air and all the negative ions and iodine helps better than any spray. The best are morning walks along the coast. Swimming in the sea water is equivalent to preparing yourself saline solution. We believe that you will like every conscientious parent take all necessary measures. We wish you a pleasant holiday that will remain in your memory.